Question; in the midst of the circumstances that surround you, are you living as a true Christian? Remember that if Christ lives in you, you: “Have been crucified with Christ and I no longer live, but Christ lives in me. The life I now live in the body, I live by faith in the Son of God, who loved me and gave himself for me“ (Galatians 2:20). God desires to transform your character and conduct in the likeness of the character and conduct of Jesus Christ. And He will do so to the extent that you allow Him. If you daily renounce all self-confidence to depend solely on the Lord, and if you refrain from making independent decisions to accept and obey His will, then the glorious life of Christ will manifest in you. It is possible, however, that it has been difficult for you to put into practice what you learned. The reason is that you have an enemy that wants to get in your way. This enemy is the devil. His purpose is to make you sin, and his weapon is temptation. But God is with you, and in His word He shows you the way to overcome. In 1 Peter 5:8 we read these words, “Be alert and of sober mind. Your enemy the devil prowls around like a roaring lion looking for someone to devour.” The devil is angry with you because once you become a child of God, he has lost you. Before your conversion to Christ, as 2 Timothy 2:26 says, the devil held you captive to do his will. But if you are now born again it is not like that anymore; and according to Colossians 1:13 God has delivered you from the power of darkness and has transferred you to the kingdom of His beloved Son. In other words, you have changed citizenship; before you belonged to the kingdom of darkness, and the devil exercised authority over you. But now you are a citizen of the kingdom of Christ, and the devil is angry with you. But the devil is also angry about the fact that now God intends to use you as a witness of His liberating power. If daily you allow Christ to live His life in you, then you will be an effective instrument in the hands of God so that other people may be saved. To prevent such a thing from happening, the devil attacks you. His purpose is to make you sin. He knows that any sin breaks your intimate communion with God; “But your iniquities have separated you from your God; your sins have hidden his face from you, so that he will not hear” (Isaiah 59:2), and we read in Psalm 66:18 that, “If I had cherished sin in my heart, the Lord would not have listened.” The devil also knows that when you turn away from the Lord, you can not bear fruit for Him, as John 15:5 teaches. 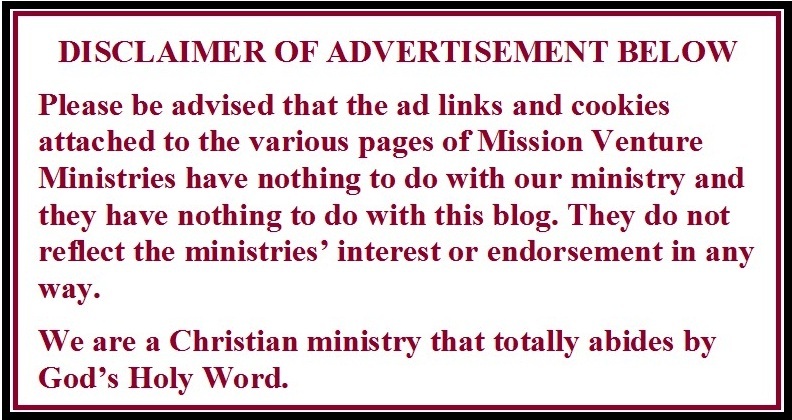 Then, to weaken your Christian testimony, the devil tries to make you sin. The weapon he uses for this is temptation. Now, we have to understand that being tempted is dangerous, but it is not the act of committing a sin. 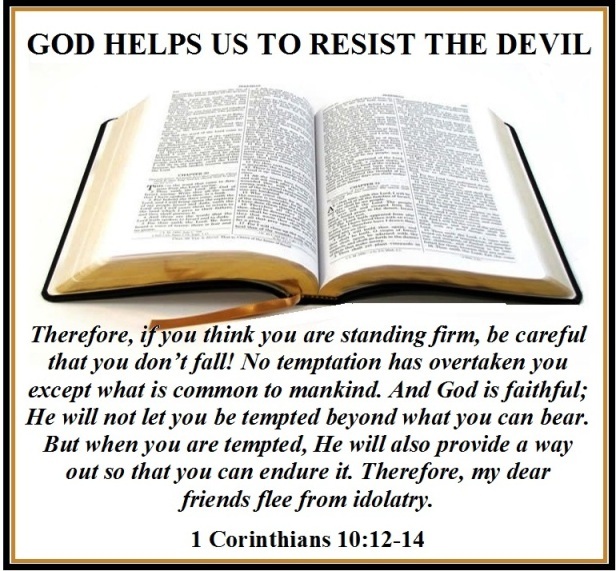 As Hebrews 4:15 teaches that the Lord Jesus “was in all points tempted as we are, yet without sin.” Sin does not consist in being tempted, but in yielding to temptation. Second, God can turn the temptation of the devil into a means of blessing. James 1:12 says: “Blessed is the man who endures temptation; for when he has been approved, he will receive the crown of life which the Lord has promised to those who love Him.“ This means that when the temptation is overcome the victorious believer is strengthened to fight better against future temptations. The third encouraging thing is that God offers to help you overcome. His offer is found in 1 Corinthians 10:12-14 which is today’s verse. So, if you think you are standing firm, be careful that you don’t fall! No temptation has overtaken you except what is common to mankind. And God is faithful; He will not let you be tempted beyond what you can bear. But when you are tempted, He will also provide a way out so that you can endure it. Therefore, my dear friends flee from idolatry. In this important passage verses twelve and fourteen are commandments, verse thirteen contains two promises. The promises are enclosed between the commandments. This indicates that they are closely related to each other. God will faithfully fulfill the two promises when you are equally faithful in obeying the two commandments. The first commandment is that you do not trust yourself at all “if you think you are standing firm, be careful that you don’t fall!” Remember Peter’s case. He confidently told Jesus: “Even if all fall away on account of you, I never will; … Even if I have to die with you, I will never disown you” (Matthew 26:33, 35). And we all know the sad result. Therefore, the first thing you have to do to overcome the temptation is to distrust yourself and to totally depend on the Lord. The second is: “flee from idolatry.” An idol is not just some image or figure. Anything that separates you from a supreme allegiance to God is an idol for you. So when you know that something tempts you to sin, you must run away from it. Now, if you have obeyed these two commands, then you can fully confirm that God will fulfill His two promises. First, He will put a stop on your enemy. He will not allow you to face any temptation that you can not overcome. And secondly, together with the temptation He allows, He will give you an exit so that you do not fall into the trap. So “resist the devil, and he will flee from you” (James 4:7), and we can do so by constantly maintaining sobriety and vigilance against his seductions, and be careful to remain “firm in the faith.” Otherwise, the pseudo-intellectualism and the social pressure to which we are subjected daily could quickly persuade us to compromise the faith, or even to turn away from it. We are commanded not to give up and to not compromise. Instead, we must “put on the full armor of God, that you may stand firm against the snares of the devil.” And we have to take “the shield of faith, with which you can quench all the fiery darts of the evil one, and take the helmet of salvation, and the sword of the Spirit, which is the word of God” (Ephesians 6:11; 16-17). This was the instrument with which the Lord Jesus Himself resisted the devil, rejecting every temptation with the word of God. The result then, as it will be with us, was that the devil “departed from Him for a season” (Luke 4:13). Our victory is in Christ. Hebrews 2:18 says, “Because He himself suffered when He was tempted, He is able to help those who are being tempted.” Thus, the closer we live to the Lord and His word, the safer we will be. Satan has no power over a true child of God; because, Satan’s power was broken and completely shattered when Jesus was resurrected from the grave.